Retaining walls are beautiful and functional elements of quality hardscaping. 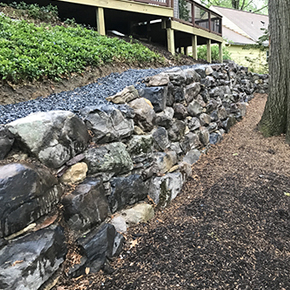 Retaining walls can accent your landscaping and reduce erosion. 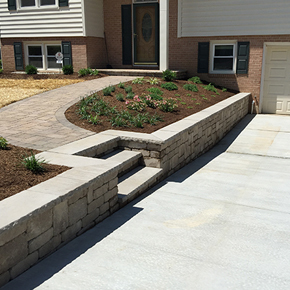 Custom retaining walls help to round out your custom landscaping design and also protect your investments. Retaining walls might look simple once they are installed, but they are incredibly complex to plan and map out. Maintaining and adjusting your grade during installation involves countless small details. A retaining wall is only effective if it is installed correctly in the right area, so trusting a professional with the job is critical. We take care of the site preparation and proper installation always considering grading and drainage along the way. Retaining wall designs are flexible and can be made to accent or coordinate with your other hardscaping, like patios or decks. Some of the most common retaining wall materials include classic bricks, natural stones, wood, patio pavers, and concrete. 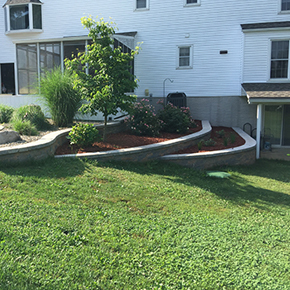 Depending on the slope of your yard and the requirements of your retaining wall, our landscape designers will help you choose the best material for the job. Carroll Landscaping has over 30 years of experience with hardscaping, hardscape installation, and custom landscape design. Our award-winning landscape designers are passionate about providing customers with top-notch service and landscape design. Our landscape designers have a creative design outlook and work as a team with our installation crews to make your vision a reality. We are committed to providing every customer with the highest quality workmanship, professional and knowledgeable service, and creativity in design in order to surpass our clients’ expectations in every aspect of the project.